SNOW! If that word is in the forecast, I am ecstatic. Snow means one thing: SKIING! I love nothing more than to spend time sliding on snow. Cruising skinny skis on groomed trails, drifting wide skis along back country make-my-own trails, flying downhill at Bridger Bowl, climbing high through forests to slide down narrow trails, or gliding flat and fast. It does not really matter; skiing is living. My go-to ski trail before the Forest Service closes the gate is Eagle Creek. We ski the trail as often as possible before New Year Day when the gate are shut. 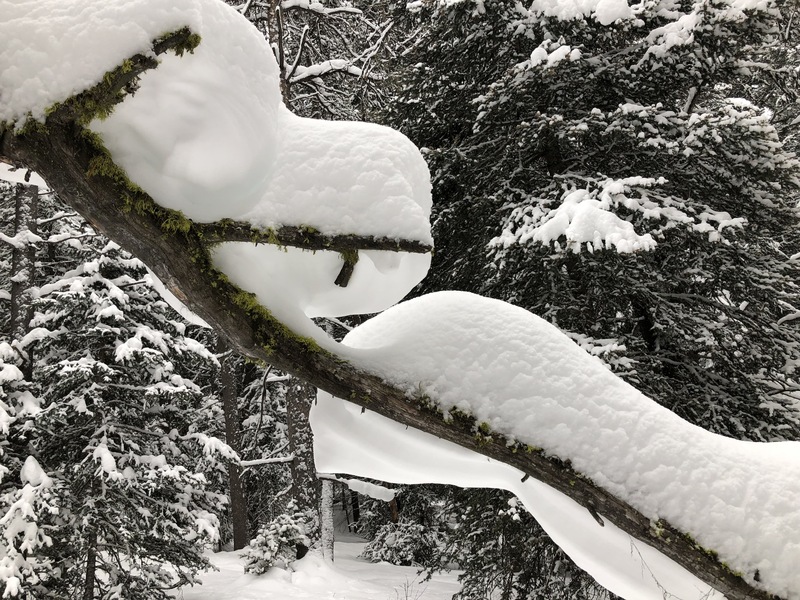 This year, November snows came early and hard so the skiing was smooth from day 1. The trail wanders narrow roads through forests – the same forests where Fred and I harvested firewood this past summer. When the view opens, Ash Mountain shows herself in winter finery and clouds float the blue sky. We stop to admire the view and grab a drink of water. We loop up and through forest then fly down through pine and fir, whooping and hollering our joy. Jardine becomes my go-to in January. Close to home, it is a quick drive to great snow, even when the grass is bare down in Gardiner’s lower elevation. Logging roads offer access to flat cruising or hilly workouts, as well as climbing for turns. Meeting other skiers often becomes a social event, as most skiers are familiar friends. 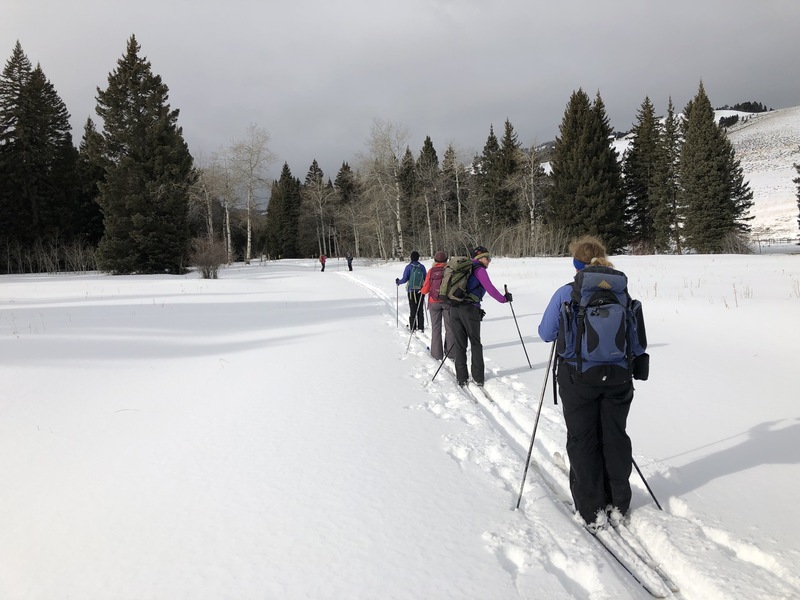 Yellowstone National Park is one of my favorite places to ski: Snow Pass and around Bunsen, the Chittenden Loop, the Bannock trail, Canyon, Old Faithful trails when I can get there… all offer world-class cross country skiing. 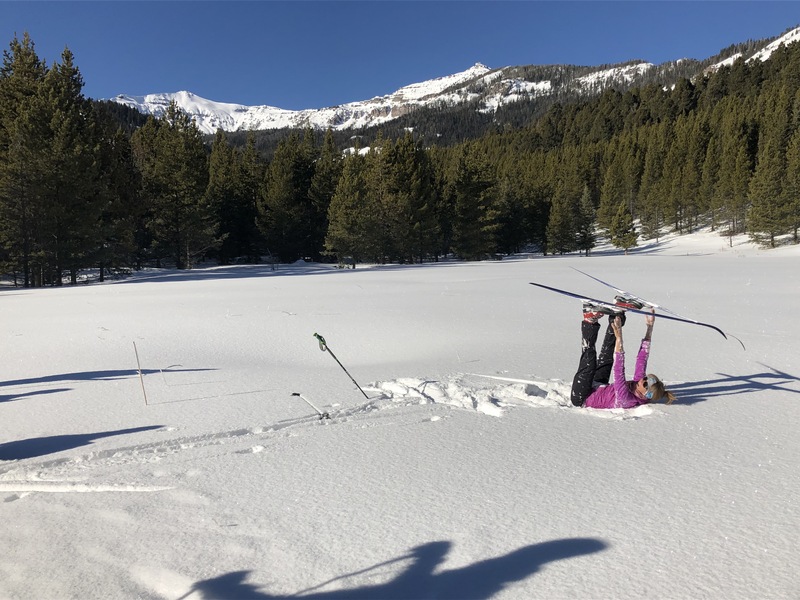 There is nothing like skiing white snow while passing steamy hot springs, geysers or bison. Fortunately, I am not the only snow-ski-lover in Gardiner, Montana. Saturday, 14 friends broke trail to a Forest Service campground, built a fire and toasted the season. The gratitude I feel for each person, for the laughter, for the beauty of the trail, expands my heart. 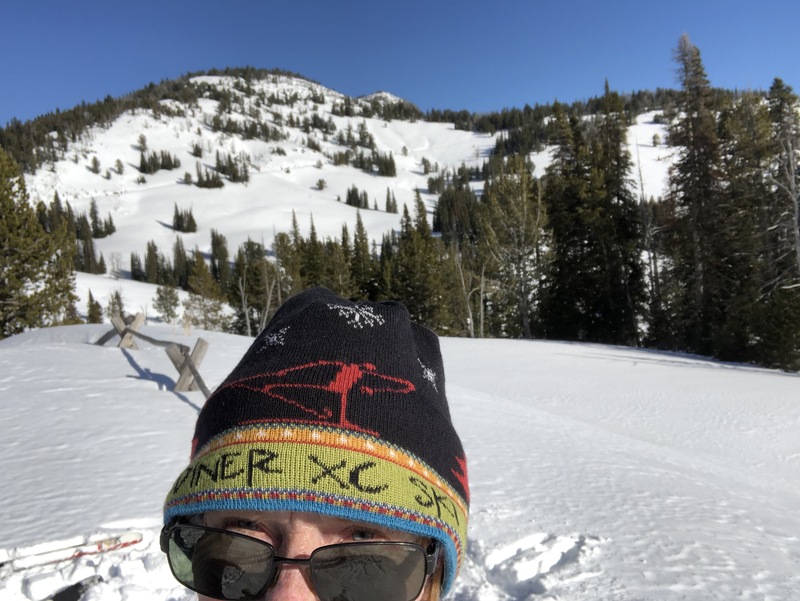 Earlier in January, I skied with friends at B-Bar Ranch—miles of groomed trails both flat and fast and hilly/curvy—take your pick! It was a day of great people helping to support our local public school on a bluebird day while enjoying the outdoor life. 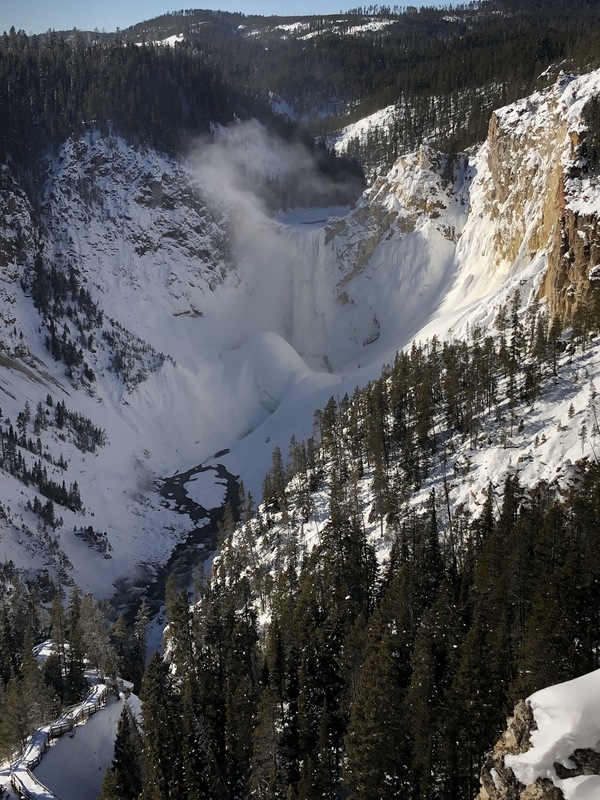 The following day I was fortunate to go to Canyon, skiing with friends along the rim above the Yellowstone River. Recently a friend posted on Face Book that she fell in love at age 12, when she saw the mountains for the first time. I responded: “We are special people… who fall in love with mountains, who come home to their mountains. You and I… we share a love affair with our mountains.” And this is true. I am grateful to be here, in the place that is home to my body, my heart and my soul. And I’m grateful to share my passion with other mountain lovers.